Watford LIVE! Is fast approaching, and 2014 promises to be bigger and better than ever! Talk about something for everyone! Watford LIVE! 2014 is an amazing showcase for local groups and individuals covering a diverse range of art based events. Dance, drama, music, visual arts sit side by side with knitting, sewing, crafting and photography which rub shoulders with literature, Tai Chi and opera! See, when we say something for everyone, we mean it! The aim of Watford LIVE! is to encourage anyone and everyone involved in any aspect of the arts here in Watford Borough to join in, be it as a contributor or spectator. Watford LIVE! is a community arts festival and as such is keen to get the whole community involved. So what can you expect to find on offer? Well, the entire programme of events is somewhat difficult to condense into a few paragraphs, particularly as additional events are being added on a daily basis. However, I can give you a taster of just some of the performances and workshops taking place. Kicking off the festival on 1st June is Dance 1. Both dance groups and individuals are invited to the new Pond Performance Area in Watford’s Parade. The schedule is currently being compiled by Vicki Shepherd, who is also co-ordinating a second day of dance, appropriately called Dance 2 at the same venue on Sunday 15th June. The Pond Performance Area will also play host to Music 1 & 2 on the 8th and 22nd June respectively. Arranged by Tom Craven expect a mixture of acoustic, bands, jazz and choir. Fancy something a little traditional? Watford Folk Dance Group offers you a chance to try some traditional English country dancing. Don’t worry if you don’t know your do-si-do from your Gay Gordon, everyone has the chance to ‘walk’ through the dances before the music starts! Classes are scheduled for every Monday evening in June at Christ Church Hall with reduced entry fee of just £1 for Watford LIVE! Why not visit or display at the Community Arts Fair? Watford LIVE! will be welcoming many of the community groups and arts organisations who work and perform in Watford. Come and have a chat to thebestof Watford at our stand, where we will be promoting thebestof members and our highly successful Buy Local campaign supporting local Watford Businesses. Recommend YOUR favourite business for the chance to enter a free draw to win two tickets to see the Magic of Motown at Watford Colosseum. The event is hosted by Watford Hospital Radio, for Watford LIVE! Find us at the Pond Performance Area on 7th June between 10.00am and 4.00pm. Also on Saturday 7th June, Parkgate Youth and Community Centre will be hosting the Drum Annual Art Exhibition. Or why not show off your talent at Watford Central Library? If you’re a budding singer/songwriter, a natural born comic, magician, poet, dancer or juggler, take part in Watford’s got Talent. Prizes worth over £100 will be awarded to the winner and runner up and entry tickets are just £5, including refreshments. Booking is essential for this event, either as a performer or audience. Call into the Library or call 0300 123 4049. Rounding off this busy Saturday will be ‘Silencio – Unplugged.’ A collection of 10 local acts playing short 15mins sets, unplugged at Watford Museum. Doors at 1800 Music at 1900 for a full evening’s entertainment. If literature is your thing, the Richard Harrington Literary Challenge Results and Performance Night is on Monday 10th June, featuring readings by the authors of their submissions of short stories and poems on the theme of ‘Peace.’ The event takes place at Cha Cha Cha Pavilion Café with free entry and a complimentary glass of wine! The annual Starlight Walk is a major fundraiser for the Peace Hospice. With over 1000 lady walkers, Watford LIVE! will be working in partnership to deliver live music and entertainment around the 13 mile route. Be at Watford Colosseum on Saturday 21 June 2014, 21:00 till 0:00. Papermouth Presents... 'Tom Craven & Friends: 10 Years of Chances' @ Watford Palace Theatre! Billed as an extravaganza of local acoustic-based solo artists, bands and more this event will be raising money for The Peace Hospice Charity at Watford Palace Theatre on 14th June 2014. This spectacular evening of entertainment will also be chronicled for a documentary that is in production, and more details, including a full line up of the artists performing can be found on the Watford LIVE! website. And talking of the Watford LIVE website, we urge you to go there. You can find links on our Events pages. As we said, with so much going on it is simply not possible to include even half of it here… consider this just a taster, a dangling carrot as it were. The Watford LIVE! website not only lets you take a bite from the carrot, but is constantly being updated, and has all the contact, venue, time and date details you need to ensure you don’t miss out on your events of choice. 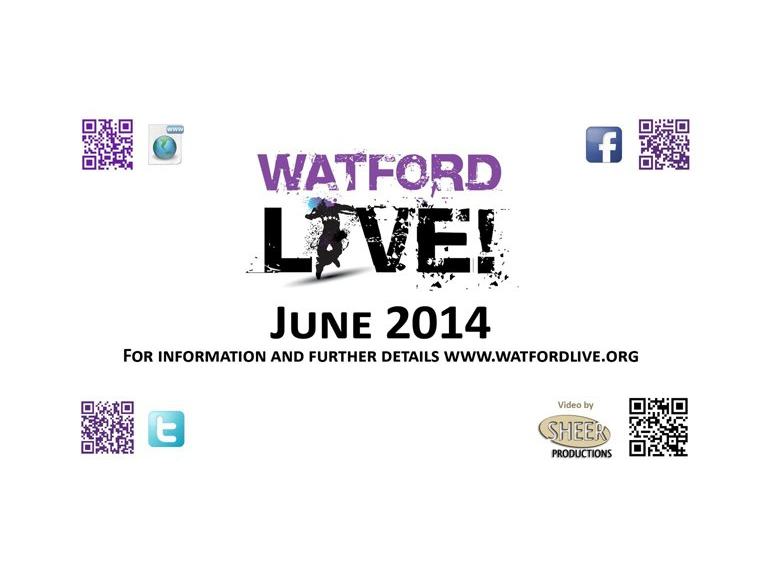 Please click here to visit our Events Page, where you will find further details about Watford LIVE! and its many events.